Fresh Australian prawns mingle on the plate with smoky, creamy taramasalata (made with smoked salmon instead of cod's roe), cooling cucumber and the crunch of prawn crackers. 1. Roughly chop the bread and soak it in the milk for 10 minutes, then squeeze dry. In a blender or food processor, combine the bread with the smoked salmon, one tablespoon of the salmon roe, grated onion, garlic, pepper, olive oil,lemon juice and three tablespoons of water and whiz until smooth. 2. Taste for lemon juice and pepper, and keep adding water by the tablespoon, whizzing, until light and almost fluffy. Refrigerate until required. 3. Shave the cucumbers into strips with a vegetable peeler, and toss in salt, sugar and vinegar. Leave for 30 minutes, then drain. 4. Heat the oil and fry the prawn crackers a few at a time, removing them with tongs as soon as they puff up. Drain on paper towel. 5. To serve, arrange a generous puddle of taramasalata on each serving plate. 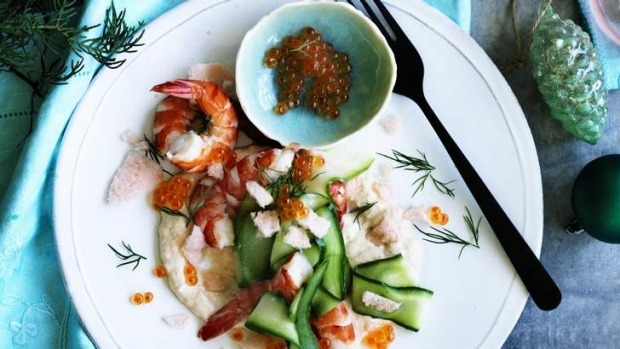 Arrange the prawns and pickled cucumber on top, scatter with dill fronds and remaining salmon roe, and serve with the prawn crackers for scooping. You can serve the prawn crackers as a canape topped with a spoonful of tarama, prawn, salmon roe and dill – but make it snappy, as the crackers will soften once topped.